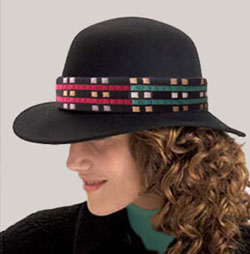 CREATE A DYNAMIC HAT BAND WITH THE SCOTCH STITCH! 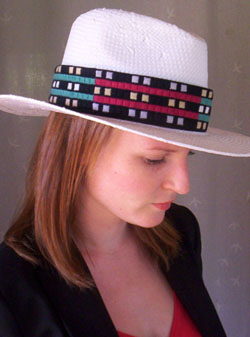 The stylized and geometric motif for this hat band design required a stitch that would create striking blocks of colour ….and the SCOTCH STITCH worked perfectly! 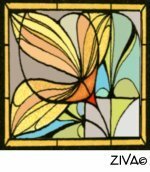 It was designed and stitched exclusively for my 14th FREE VIVA ZIVA ! Newsletter #1314. 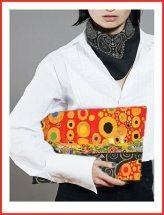 Subscribe now to ZIVA’s free newsletter ... to be released in October, 2013 and stitch this very contemporary design “Scots’ Scotch”, inspired by the early 20th century Modernist Scottish designs of the Glasgow Four. Around 1885, a group of four young Scottish architects and designers, through association with the Glasgow School of Art, formed a loose alliance that would stimulate a creative revolution across Europe. 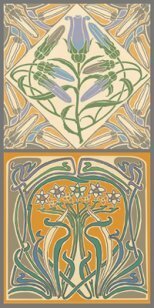 Together they took elements from the Arts and Crafts and Art Nouveau styles that were popular at the time and passed them through the filter of the Celtic Revival to produce something new. Their bold move towards abstraction is all the more remarkable for occcurring more than a decade before the Cubist movement gained momentum. Skilled in a variety of media such as watercolour, metalwork, embroidery and textiles, Margaret MacDonald Mackintosh challenged traditional Victorian chintzes and naturalist imagery with her stylized motifs and geometric patterns. 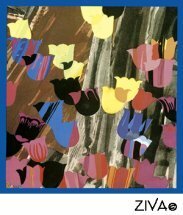 She also worked closely with husband Mackintosh on interior design. Together they created futuristic interiors which still work today. 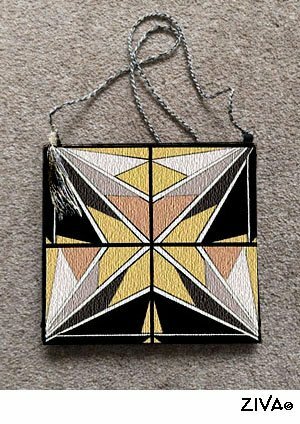 With her textiles, MacDonald usually used a series of abstract patterns based on geometric shapes… triangles, grids, squares, and diamonds in vivid colours often set against a grey or black background. 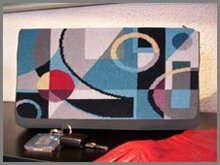 These “Jazz Age” designs, several years before their time, must have looked stunning made into drapes or used as dress or upholstery materials. 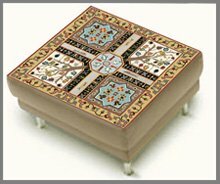 With that in mind, I took one of Margaret Macdonald’s rhythmic abstract designs (seen above in a range of browns and golds) and added the vivid colours she used on other textiles. 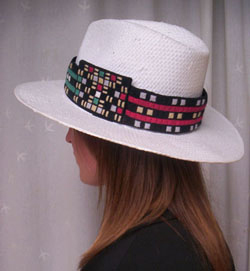 I incorporated today’s popular hat colours, (white, black or straw colour), into the hat band motif and accented it with alternating bands of deep red and blue-turquoise…allowing a coordinated fashion effect to suit many hat styles and colours. Other accents colours could be used to match your wardrobe. 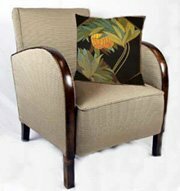 If you like this bold design, have a look at other Mackintosh designs from ZIVA. 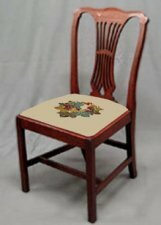 The Scotch Stitch, a traditional embroidery stitch, is worked similarly to continental stitch, working right to left, but is worked as a block of stitches featuring differing lengths. As shown in the photo at left, a group of diagonal stitches is worked to form a small square. For the 'Scots’ Scotch' hat band design, stitches were worked over 1, 2, 3, 4, 3, 2, and 1 threads. The blocks can also be worked alternating the diagonals, called Reversed Scotch Stitch. 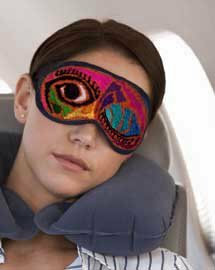 Frequently the pattern is worked in two contrasting colours. Also different scales, colour combinations and directions are possible. 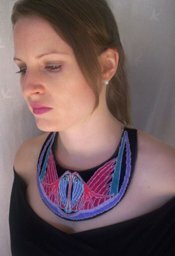 OTHER STITCHING AND WEARING OPTIONS? 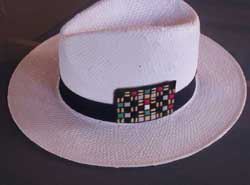 By purposely incorporating today’s popular hat colours in the design, the hat band also can work with other hat colours, such as the striking black hat above. 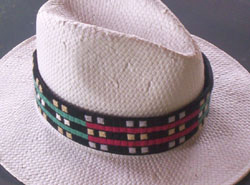 Note: This hat band has been stitched without the side medallion. 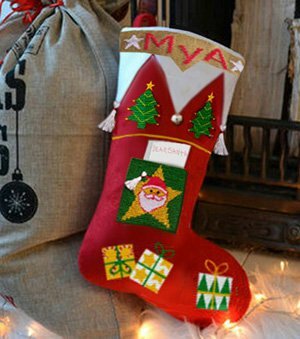 You could also just stitch the rectangular medallion and attach it at the side to a wide ribbon in a complementary colour. This idea would work well with a man’s hat. Several options are possible! Add your own accent colours to match your wardrobe! Or why not make up a camera or guitar strap! Or a belt! 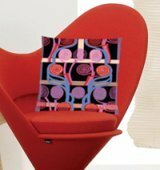 This bold and modern pattern will appeal to all ages! 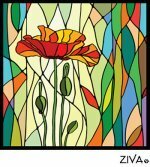 The fourteenth VIVA ZIVA! 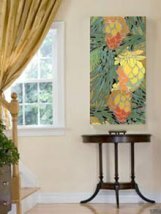 Newsletter updates you about my new designs and features I’ve recently added to the ZIVA Collection. FIFTH ANNIVERSARY SALE! Dates of the Sale to be announced in the Newsletter! 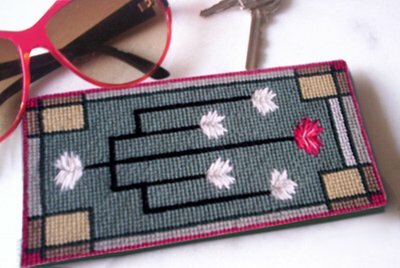 Needlepoint chart of the ‘Scots’ Scotch ’ Early Modernist hat band design. 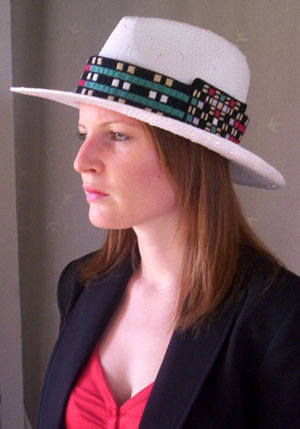 Don’t miss this free ‘Scots’ Scotch’ pattern … and create this hat band using the Scotch Stitch ….a vivid modernist design inspired by the Glasgow Four! 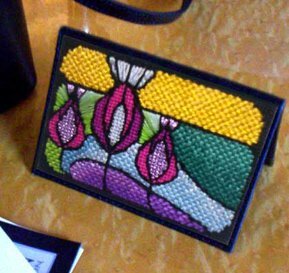 Go from this free Scotch Stitch hat band design, and have a look at other free needlepoint designs included in VIVA ZIVA newsletters!